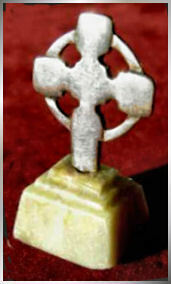 Unusual MacKinnon's Cross, from one of Alexander Ritchie's original moulds passed down through Hannah MacCormick to Celtic Art Industries in the 1940s. Not many of these were made, certainly in comparison with St Martin's cross. This one is silver plated brass, and dates mid to late 1940s. Makers mark DB for Hamish Dawson Bowman, with CAI (Celtic Art Industries) and IONA, SCOTLAND. A very fine cross, with accurate detail of Gryphon (mythical beastie much used by Ritchie) and longship, with foliate ornament, taken from the original 8th century cross shaft now in Iona Abbey museum. Overall height with base,13.2cms. CAI silver Celtic cross from the early 1940s, mounted in polished Iona marble (not imported Connemara marble as many later pieces were). This beautiful little cross is only 1.5" high, and has the reverse marks of CAI - IONA - SCOTLAND. 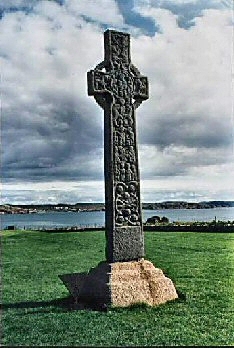 The plain Celtic cross design was used on various earlier pieces by Alexander Ritchie, this design being taken from a small 6th/7th century carved stone known as St Columba's pillow, which is now in the Island's Museum. Marks on the reverse of the cross are very small. From left to right they are CAI (within an inset rectangle) - IONA - and SCOTLAND. Four years after the death of Alexander and Euphemia Ritchie in 1941, a company called Celtic Art Industries was founded in 1945 by Hamish Dawson-Bowman, an enthusiast of the Ritchie’s work and also of the ancient and medieval carved stones of Iona. He and his wife had been married in Iona Abbey just prior to the war, and his wife also was very familiar with the island. 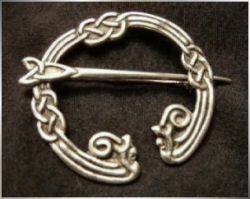 CAI silver sword brooch with longship in full sail. 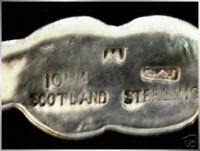 The reverse is stamped IONA CAI STERLING. Date late 1940s. Hamish Dawson-Bowman also bought the Island of Erraid in the early 1950s. This tiny island lies off the tip of the west coast of Mull and overlooks Iona. I was very fortunate in my younger days in the 1960s to have as a good friend and mentor an elderly lady called Ella Horsey, who spent seven years living on Erraid as a semi-recluse and writer, from 1952 to 1959. It was she who introduced me at an ealy age to many of the lesser-known and awe-inspiring aspects of Iona, as well as the fine craftwork of Iain MacCormick. She passed on about twenty five years ago, and no doubt is now enjoying views of her beloved Iona from a higher plane! She published a book of her island experiences entitled 'Erraid - Seven Years on a Scottish Islet' (Regency Press, 1967) which can still occasionally be located through specialist book searches. 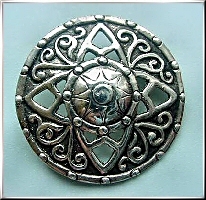 Silver convex pierced shield brooch c.1946 by Celtic Art Industries. This brooch is one of Alexander Ritchies original designs continued after his death (he was using this design at least 15 years earlier), and has the large raised 'Iona' marks, and stamped CAI and Sterling, Scotland in the centre. 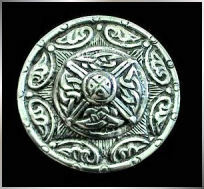 Celtic Art Industries, abbreviated to C.A.I and sometimes used as a stamp on silver items, was founded with the intention of continuing the production of jewellery in the Iona tradition. Certainly two of the three craftsmen involved in this venture have become well known to enthusiasts of traditional Scottish jewellery. The three were Iain MacCormick, Malachy Gormley, and John Hart. They worked at this time from an old farm building in the Glasgow area, maintaining a strong link with Iona - as Iain MacCormick’s mother managed the crafts shop on the island and also gave the C.A.I some original Ritchie designs which had been left to her. 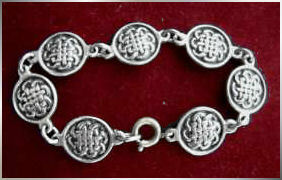 Sterling silver knotwork bracelet by Celtic Art industries - comprising six links, two stamped CAI in recessed rectangle, two stamped 'silver', and two stamped DB for Hamish Dawson-Bowman. Made c.1950. Occasionally individual early pieces carried a double hallmark to identify individual silversmiths. Below is a picture of marks from a spoon made by Iain MacCormick during the Hamish Dawson-Bowman early period of CAI. It carries both IMC and DB marks. Pieces with such marks are scarce today. In subsequent years two of these three left the CAI and pursued their own careers. Malachy Gormley however continued working with the CAI, and died in 1975. Occasionally the CAI produced basic repicas of the classic brooches such as the early Tara and Hunterston originals. Many jewellers have been making replicas of these since early Victorian times, but those made by Alexander Ritchie himself in the 1920s and later with the ICA stamp in the 1930s were the most highly detailed and finely cast. This later CAI brooch above is based on the Hunterston Brooch and was produced by the company in the 1940s. Marks on the reverse are CAI - STERLING - SCOTLAND. Iain MacCormick was passionate about Celtic silverwork and continued to produce much jewellery as well as pursuing a career as a teacher on the mainland. His jewellery has a very distinctive Ritchie flavour, gained from the unique experience of an apprenticeship as a boy with Alexander Ritchie in his workshop at Shuna Cottage on Iona. Much later in his life he published a small book of drawings of all the Ritchie designs known to him. He died in 1997 at the age of 80, and his work is already much sought-after. 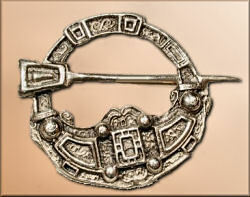 Early CAI silver penannular brooch with knotwork patterning and zoomorphic terminals. Interesting reverse marks of CAI STERLING SCOTLND IONA and impressed letter 'M'. (Possibly Iain MacCormick's mark prior to his leaving CAI?). He subsequently used IMC as his own personal stamp. Unusual brooch. 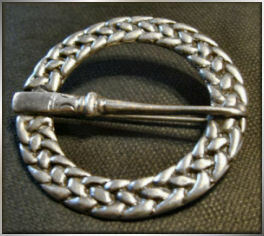 This fine ring brooch is an unusual example of Alexander Ritchie’s designs being continued by Celtic Art Industries. Perhaps this was part of some remaining stock soon after he died. It is the only example I have seen with an embossed stamp of AR IONA together with a recessed stamp of CAI and embossed wording ‘Scotland – Sterling’. The pin design is slightly different to Ritchie’s original brooch of this design, which he introduced into his jewellery range in the early 1920s. This CAI one dates from circa 1945. John Hart (senior) started his own business in the 1950s after working with the C.A.I, and continued working with Celtic jewellery until his retirement in 1979. His son, also John Hart, continued the craftwork tradition by starting his own business called Hebridean Jewellery on the island of South Uist in 1979. Hebridean Jewellery still produce much fine work on South Uist, which is sold worldwide. Shown above is a fine CAI shield brooch with foliate decoration and knotwork centre, c.1950.This was almost certainly from an original Alexander Ritchie mould. 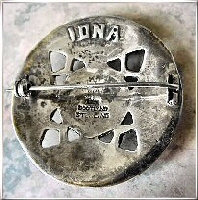 The reverse markings are CAI in small recessed rectange, and IONA, SCOTLAND, STERLING. Click for examples of jewellery and metalwork from the 1950s and 60s by Iain MacCormick and John Hart.